Creating a fresh blend of cerebral introspection and brash attitude, it’s no wonder that J. Cole tapped Cozz to be the L.A. representative on his Dreamville label. Striking out on the road for the second time this year, Cozz announces his role as the primary support at on Dom Kennedy’s “Win Or Lose Tour.“ Kicking off on October 28th in Detroit, the “Win Or Lose Tour” spans the nation, reaching Chicago on Halloween night, stopping in New York City’s Sony Hall on November 3rd, and passing through several other major markets in the East Coast, South, and Midwest before heading to Cozz’s home West Coast for a 12 dates. To accompany the tour announcement, Cozz shares The Effected Tour Documentary, a new short film that provides a glimpse at life on the road during “The Effected Tour.” Soundtracked by many of Effected‘s myriad highlights, The Effected Tour Documentary features numerous clips of crowds wilding out to Cozz’s performances, as well as behind-the-scenes glimpses that showcase Cozz’s charm, determination, and sense of humor. Ranging from studio sessions, to late night eats, to competitive games of NBA 2K, to entertaining sessions of playful insults, The Effected Tour Documentary showcases a rising artist with a solid sense of self-awareness and deep gratitude to his fans and his team who helped him reach his status. 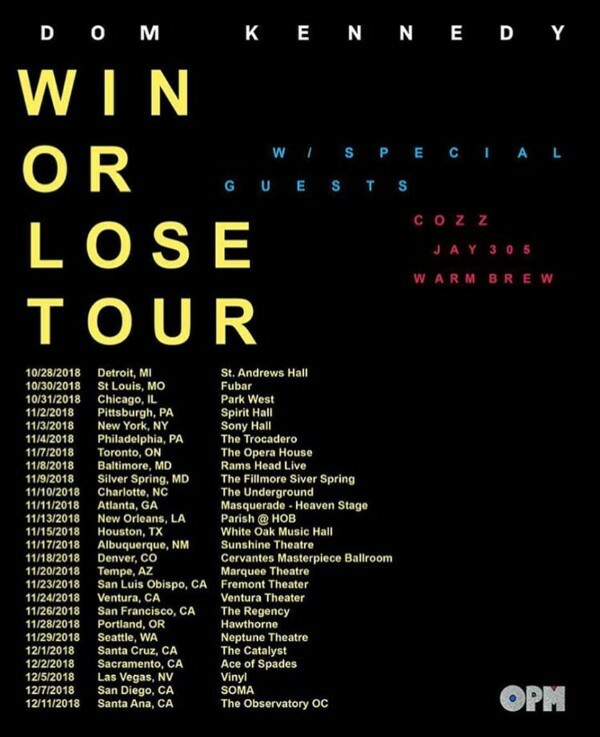 Cozz’s prominent spot on the “Win Or Lose Tour,” which also features support from Jay 305 and Warm Brew, closes out an eventful 2018 for Cozz, who released Effected (Dreamville/Interscope Records),which features A-list collaborations with Kendrick Lamar, J. Cole, and Curren$y, in February, and headlined “The Effected Tour” in the Spring. A favorite artist of Issa Rae’s, Cozz earned a shout-out in the first season of Insecure. 11/8/2018 – Baltimore, MD – Rams Head Live! Born Cody Osagie, Cozz made his debut in 2013 with a video for his introspective song “Dreams.” The track caught the attention of J. Cole, who signed Cozz to his Dreamville imprint that year. In 2014, the rapper released his Cozz & Effect project, featuring the Meez-produced single “Cody Macc.” His debut mixtape Nothin’ Personal then arrived in January 2016. Later that year, Issa Rae shouted out Cozz in episode 4 of the first season of her HBO series Insecure.